The joviality of the holidays has come upon me. Tomorrow I will share a meal with family and later this weekend will begin decorating my home with Christmas trees and lights. Already I've been thinking of gifts to give loved ones, and well, I can't leave my beloved blog readers out! As my gift to you, I'd like to pass on these good vibes - and what better way than to have a sale? And not a run-of-the-mill sale ... a big one. And rewarding to those who shop early. So here's the deal: all weekend (11/26 - 11/29) use coupon code WeekendSale25 to get 25% off your purchase, and if you'd like it gift wrapped, convo me and it's on the house! 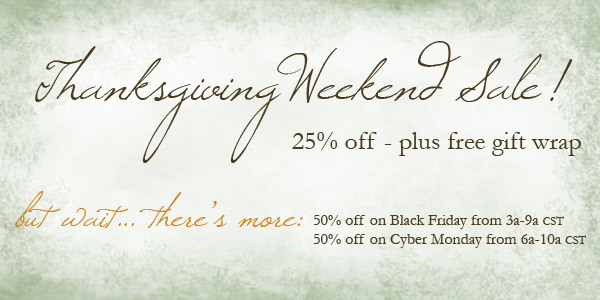 Shop early on Black Friday (from 3am - 9am CST) and use coupon code BlackFriday50 for 50% off. Or if you're more the Cyber Monday type, place your order between 6am - 10am and use coupon code CyberMonday50 to save 50% that day. There you have it! Hope your Thanksgiving is filled with gratitude and your following days filled with joy. I know I'm thankful for each of you!